Chuwi has about 47 different tablets on the market and one of their somewhat newer models, the Chuwi Hi8, is a strong competitor to the new Fire HD 8 that was released for 2016. The Chuwi Hi8 is an interesting tablet. For starters, it’s a dual boot tablet that has Windows 10 and Android 4.4 KitKat. Plus it has better specs than the Fire HD 8 and it sells for the same price at $89. The biggest step up is the screen. It has an 8-inch 1920 x 1200 resolution screen with 283 ppi—that’s almost 100 ppi more than the Fire HD 8. Other specs for the Chuwi Hi8 included a 2.16GHZ Intel quad-core processor with 2GB of RAM and 32 GB of storage space. It has Bluetooth 4.0, Wi-Fi, stereo speakers, a mic, and a memory card slot that supports card up to 128GB. The cameras are definitely the weak point, though. It has a 0.3MP front camera and a 2MP rear camera. The battery life probably isn’t anywhere near the Fire HD 8’s 12 hours either. I’ve never tried any Chuwi products before but it looks like an interesting tablet for the price. It definitely has a lot more going for it than the Fire HD 8 if you don’t mind using an older version of Android, but at least it’s got Windows 10 going for it as well. If anyone happens to get one of these tablets let us know what you think of it in the comments section below. TF = TransFlash = micro SD without SDIO support (which is not of any consequence in modern tablets). Very strange. Amazon has another listing for this product. It seems like the same product. You’re right. They do appear to be the same. Chuwi has so many different listings for tablets that it’s downright confusing. I changed the link to yours since it’s $10 cheaper. When I first clicked the link yesterday it took me to a page with no questions or reviews yet. Now both links go to pages with questions and reviews going back almost a year. An Amazon search brought up many different hits but so far I haven’t found my way back to the one that appeared to be a new product. Very confusing! The original link is a couple comments up. Some 3rd party merchant is selling it instead of Chuwidirect and they created a new page instead of using the existing one to make it appear like a newer listing, I guess. There’s the Chuwi Hi8 Pro as well with a newer x5 Z8300 CPU and Android 5.1/Win 10 dual boot. Don’t know if they’ve got a listing for that on amazon in the US (not based there), but banggood, gearbest and other Chinese importer sites sell them for around 80-90€ (e.g. 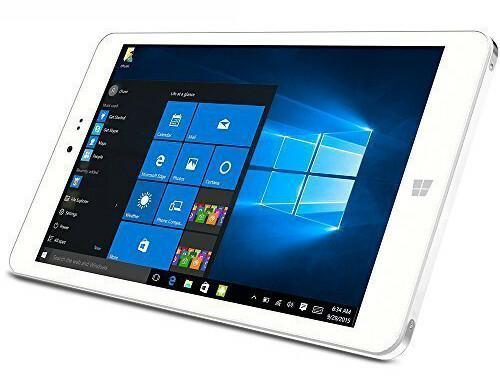 http://www.banggood.com/Original-Box-Chuwi-HI8-Pro-32GB-Intel-Z8300-Quad-Core-1_84GHz-8-Inch-Dual-OS-Tablet-p-1051029.html?rmmds=search). Teclast and Cube also have very similar offerings (Teclast X80 Pro and Cube iWork8). As rightly pointed out above, battery life is probably the weakest point of these tablets. Haven’t used one myself yet, but from the reviews I saw, that’s their biggest minus. If you don’t mind having a power bank or don’t need more than a few hours, they seem like interesting choices.